As I may have mentioned in my previous posts, I have always enjoyed deep-sky observing with my telescopes. My favorite type of deep-sky objects to observe is galaxies. I especially enjoy barred spiral galaxies due to their unique characteristics. Many of the observable galaxies with backyard telescopes are designated as "Faint Fuzzies" due to their low magnitudes and lack of characteristics through smaller telescopes. However, there are many galaxies that are observable with smaller backyard telescopes that have many distinct characteristics an observer is able to enjoy. For example... M51, "The Whirlpool Galaxy" in Canes Venatici, M31 - "The Andromeda Galaxy" in Andromeda and M104 - "The Sombrero Galaxy" located in Virgo is to name a few that are visible in the northern hemisphere with smaller backyard telescopes. NGC 1365 - The "Great Barred Spiral Galaxy" Imaged by Insight Observatory. When I started flipping through the pages of the January 2016 issue of "Sky and Telescope" magazine, I almost immediately opened the publication to the article "The Definitive Barred Spiral - NGC 1365" in the "Observing: Going Deep" section by Howard Banich. Banich's article is well written and describes several of his observations of this island universe in great detail with quotes from his observing log as well as detailed sketches of NGC 1365 he recorded using different sized telescopes and magnifications. Banich observed the galaxy utilizing telescope with mirror sizes from 8" up to a 28" over the span of a few years. The drawings and photograph of the barred spiral in the article gave me the inspiration to observe the galaxy myself. One problem... The galaxy can only be seen in the southern hemisphere. NGC 1365, also known as the "Great Barred Spiral Galaxy", is located in the constellation Fornax. After reading Banich's article, I logged onto the remote robotic telescope network we use here at Insight Observatory and was able to acquire a 10-minute exposure of the galaxy using a one-shot color CCD camera (inserted in this article). I guess the point of this blog entry is to continue stressing the value of having accessibility to remote robotic telescopes around the globe. I may not be able to visually observe this interesting deep-sky object due to my physical location here in the northeastern area of the United States, however, I was able to capture an image immediately from my desktop computer that I could process and study the fine characteristics this object has to offer. A very bright supernova was discovered by Alain Klotz with the TAROT telescope at the La Silla Observatory in Chile on October 27, 2012, in NGC 136. The supernova was designated 2012fr. NGC1365 is a giant Seyfert type galaxy with a diameter of 200,000 light years. It is arguably the most prominent barred spiral in the sky. The bar rotates clockwise with velocities in the nucleus of 2000 km/sec resulting in one rotation in 350 million years. Wow; good image. I can see a few other galaxies, as well. 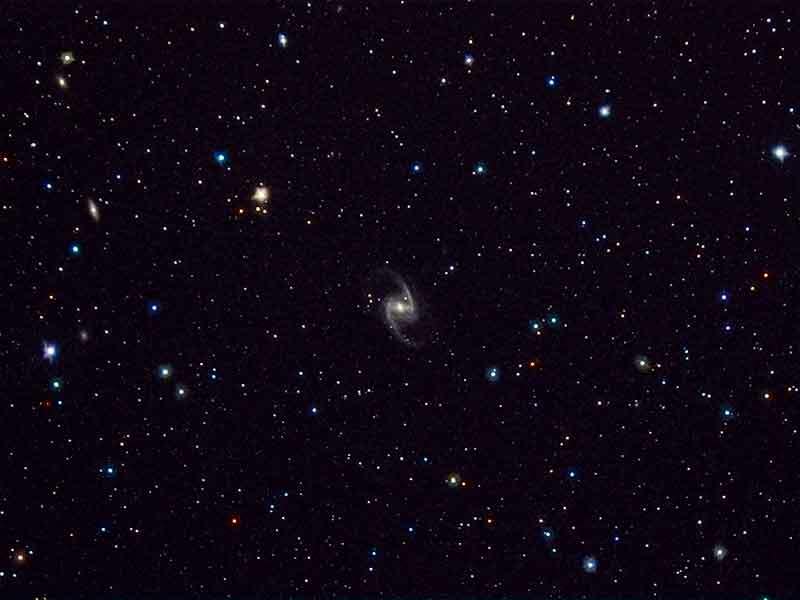 I can see two other galaxies as well, however, I'm not sure of their designations.